This was my first book by D. Jackson Leigh and it didn't disappoint. 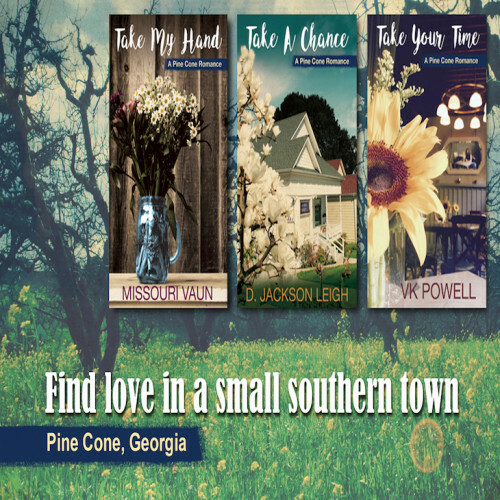 This is part of a trilogy of books that takes place in the same fictional Georgia town, each by different authors. We open on Trip Beaumont, a large animal vet with a quick wit and a penchant for illegal parking. We learn early on that she's no stranger to the ladies, and I fell for the humor of the book very early on. Enter Jamie Grant, post-military, with a trained service dog now working for the local police (and enjoying ticketing Trip's always errant vehicle). I really enjoyed this book...it was humorous and also very grounded. I loved the small town feel about it, how Jamie dealt with the local drama, and how interconnected things were without it being over the top. This made me laugh and also want to volunteer with the local girls and boys club. Excellent steamy romance with a side of college history and great supporting characters. When I first started this book, I had no idea it was a member of a series that were all set in the same town, but all focused on different characters in that 'world'/town. I loved the concept, I didn't care in what order I'd come into it. I came to adore the town, it sounds like the kind of place I'd like to live. It has a wide range of characters bound to keep life interesting. I was glad Trip and Jamie got over their past hurts. and Petunia...she is the star of the whole book, really. What a sweetheart. I think I felt worse for her past than the humans in the story. she never had a choice in what happened to her. Anyway, I'll be searching out the other two books in this series. It doesn't matter which order you read the three in. Just read them and be charmed. My first book by D Jackson Leigh, which I picked up after reading Missouri Vaun's book set in the same small town. Kudos to Boldstrokes for coming up with this idea of having three authors tell related stories because it finally got me to read Leigh...Leigh does a terrific job at characters, they were very well drawn and interesting. I loved all the details of Trip's veterinary practice, it's clear that this author knows and loves animals...I look forward to explore this author's catalog. ...this is a great read. Trip is the local vet, while Jamie is a ex military cop who now works for the Pine cone Police department. They both have history, as they were college mates and a sorry turn of events led to their estrangement. After almost 15 years they get a second chance to revisit their relationship. They bond over Jamie's dog Petunia, who has a gastric problem, and it goes them a reason to talk to each other. This story was not something new. But the southern setting gives it a charming look. Not to forget the whacky citizens of Pine cone. I did find it difficult to navigate through some southern terms but other than that i found this to be a witty book. I loved Jamie's character and the entire troupe about parking tickets was hilarious. ...I was looking forward to reading the second book in this series because I have read all of Ms. Leigh’s books and thoroughly enjoyed them. I was not disappointed at all with this book. I enjoyed the humor in addition to the well-developed plot. From the very beginning of Take a Chance, I was drawn into the story. At first, I thought it might be a little awkward to have a reiteration of story situations, but Ms. Leigh was able to make it unique from Trip’s viewpoint. Trip is the town’s veterinarian and never has a problem attracting women. She is intelligent, good-looking, wealthy and good at her profession. Jamie Grant is new to town and gets hired as a deputy. Trip finds it difficult to start up a relationship with her because of previous bad history between them. I highly recommend this book and give it 5 out of 5 stars. I look forward to book 3 in the series.